Kiosk Mode is a technique to control contact creation as well as existing contact updates on Forms. Using of one device or one IP address to collect submitted contact information on a form then this setting will differentiate when each new contact uploaded rather than merging them into one. Go to Assets > Forms > New. 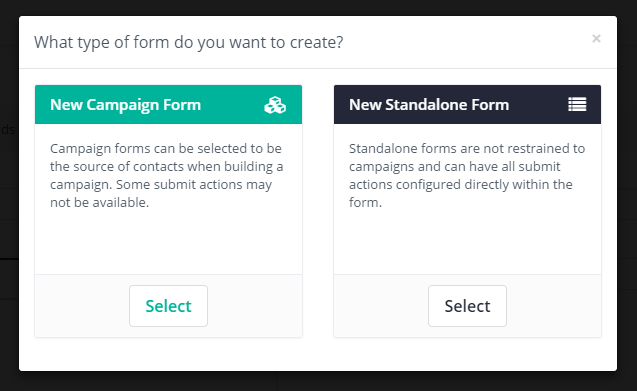 Select the type of form you want to create “New Campaign Form” or “New Standalone Form”. In the new window fill all the desired columns. On the right side of the screen, at preferred Kiosk mode as “Yes” or “No” accordingly. When the kiosk mode is turned on, each submission will create a new contact. When a kiosk mode is turned off, contacts will be edited based on the current session information. Note: – If you set the “Kiosk Mode” to “Yes”, then form submissions will not generate a new contact tracking cookies or assign the IP address to the created/updated contacts.